© photo: Daniel Peh K.L. 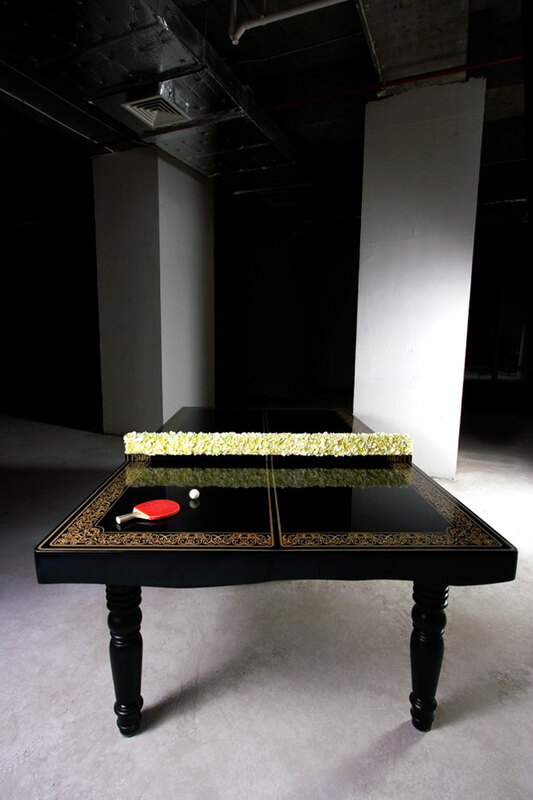 PING-PONG Dining table harks back to the origins of table-tennis with its duality of both being a table fit for dining and playing on. 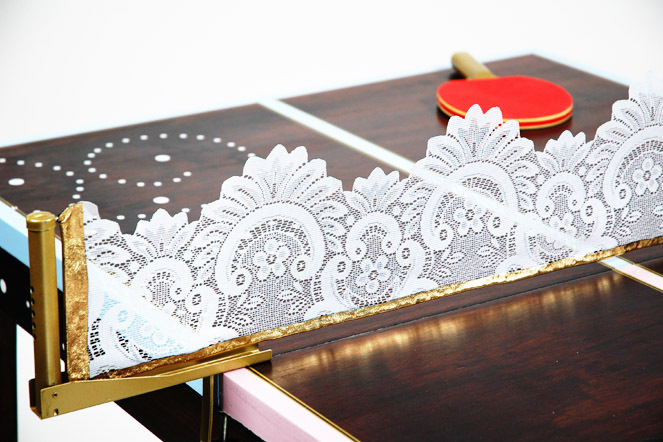 What started off as impromptu after-dinner amusement mimicking tennis in an indoor environment for upper-class Victorians became an international phenomenon with rules and standards. 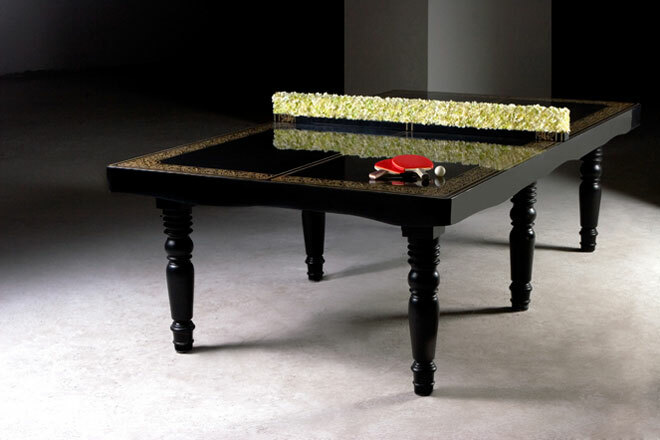 This is an official-sized game table with a DuPont™ Corian® surface CNC machine-routed with French Rococo patterns interjected with Ping-pong iconography filled with gold lacquer, supported by stately hand-lathed timber legs. In the middle, a long rectangular vase filled with dainty blossoms does double-duty as a game-net and a table floral arrangement. 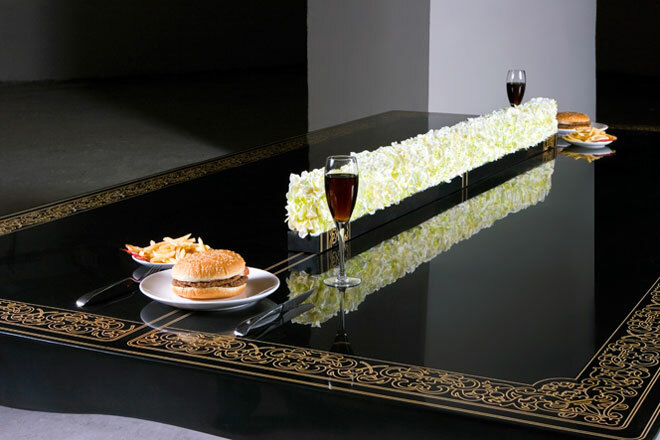 Reinstating grandeur and pomp with neo-classical inspired embellishments , with a twist in material by using the hi-tech marble-like Corian, the PING-PONG dining table creates a remarkable conceptual and lifestyle statement in the true heart of the home, the dining area. This design piece is the first collaboration of Mein Gallery, the show-space of interior lifestyle concept brand Mein, dedicated to commissioning and showcasing works of young and upcoming designers, and Hunn Wai. Hunn Wai is a young Singaporean designer who received his Masters education at the Design Academy Eindhoven under Gijs Bakker, co-founder of droog design, and has exhibited in Milan, Cologne, Tokyo, London and Venice. His works have also been featured in noted publications such as Icon, VIEWPOINT and most recently Berlin publishing house Die Gestalten Verlag's "DESIRE: The Shape of Things to Come". He is currently based in Shanghai, China. 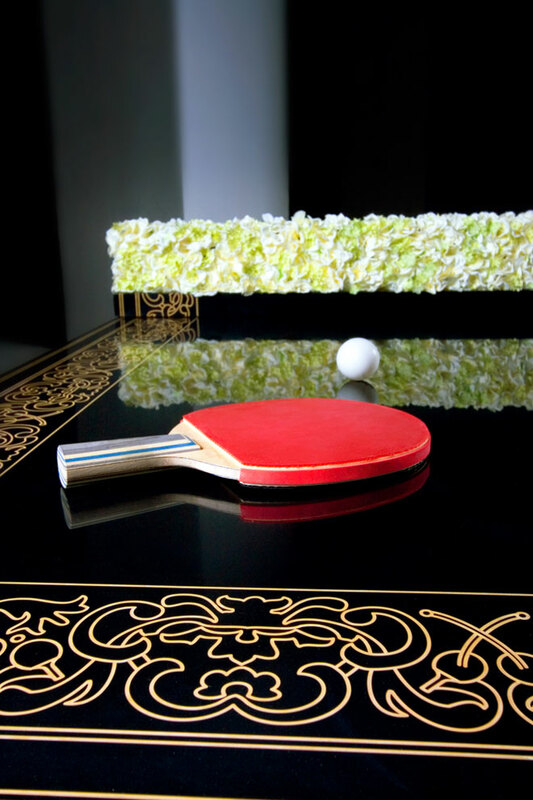 Hunn Wai, a ping-pong enthusiast himself, recalled the history of the game, once an after-meal pass-time of aristocrats. By combining the formal language of a classical dining table with official ping-pong table characteristics, as well as using DuPont™ Corian®, a main kitchen worktop material, as the table surface, what results is a cross-over of aesthetic languages, material qualities and spheres of usage.